On July 20th, 2011, the Space Shuttle Atlantis will touch down after a 12 day mission, marking the end of an era. Never again will one of these distinguished spacecraft grace the launch pad of Cape Canaveral, rocket through the sky above the Atlantic, or reach onward to that great frontier beyond the wisp of our tiny world’s atmosphere. Instead, NASA’s remaining space shuttles, the Atlantis, Discovery, and Endeavour, will be retired and most likely sent to museums (Discovery is already earmarked for the Smithsonian). What, then, will remain of America’s manned space program? Obviously, NASA will go on. NASA Administrator Charles F. Bolden has stated the future is bright and promised that one day humans will land on Mars. Furthermore, the retirement of the shuttle will allow NASA’s depressingly meager budget to be focused on deep space expiration, as it should, and the development of systems and technologies to take us back to the Moon and to Mars. At least, here’s hoping. Nevertheless, the unfortunate fact remains that there is no viable shuttle replacement. Commercial space ventures such as SpaceX, Bigelow Aerospace, and Virgin Galactic (although I still find the name a bit over ambitious for the 21st century), will pick up the slack over the next decade. In truth, the space shuttle is a 30 years old vehicle, and while it is most certainly due for retirement, there is a certain romantic air that a mere rocket carried capsule lacks. Perhaps it’s the fact that the shuttle actually looks like a proper spaceship, rather than a conical-shaped tin can. In tribute to the shuttle, Space.com currently has several galleries dedicated to the memory of its past glory days. I point to you the gallery of Retro Space Pictures: Building Shuttle Atlantis, a gallery showing the inside of Discovery, 5 Patriotic Missions, and the Space Shuttle Atlantis on the Launch Pad for its final mission. Finally, here’s a nice montage tribute to Atlantis. And just because I think it’s cool, and somewhat appropriate, here’s the extended Rod Stewart cut of the Enterprise series intro song, “Faith of the Heart”. 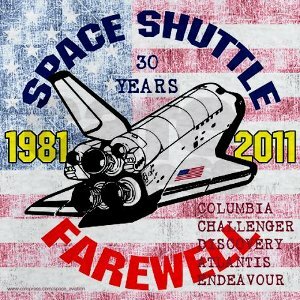 So long space shuttles: Enterprise, Columbia, Challenger, Discovery, Atlantis, and Endeavour. And thank you to all who gave their time and effort to build and maintain them, to the brave men and women who piloted them, and to the heroes who gave their lives for the advancement of human exploration and the conquest of space. Here’s to the next 100 years. Next story Shuttle Age Over, What Now?